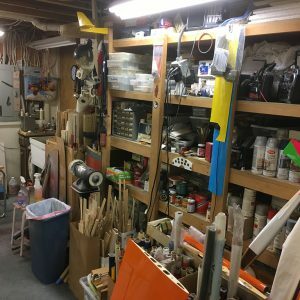 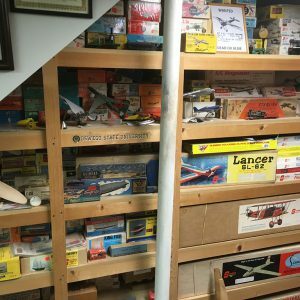 About a year ago, I learned of a Rochester, New York modeler who has a veritable hobby shop in his basement. 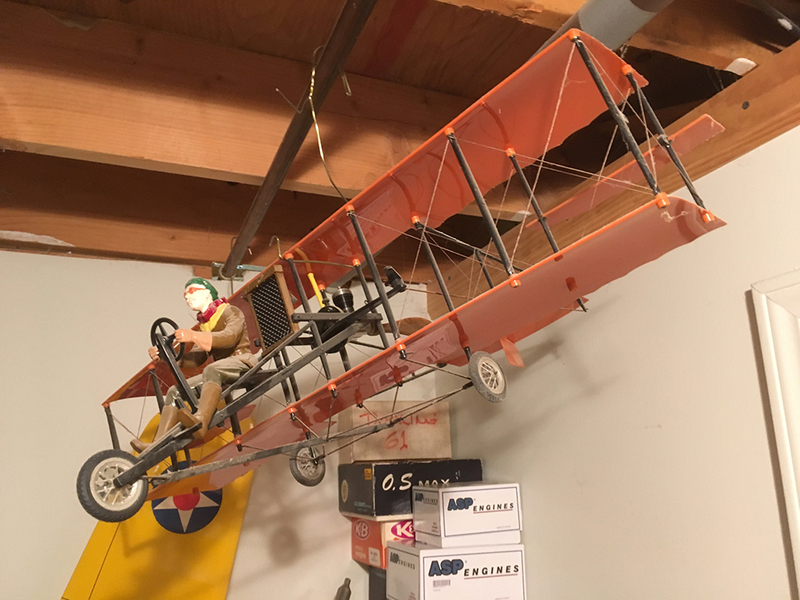 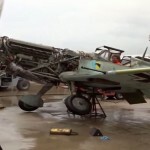 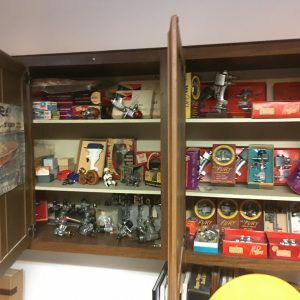 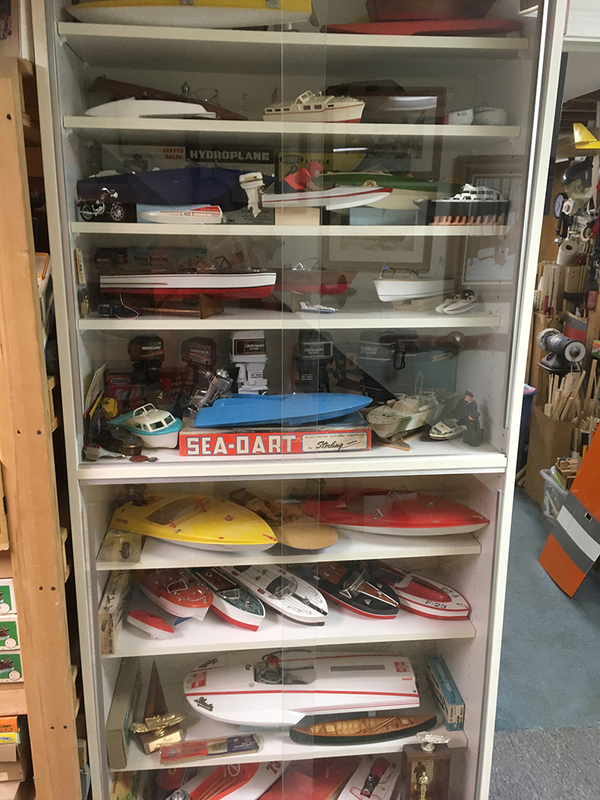 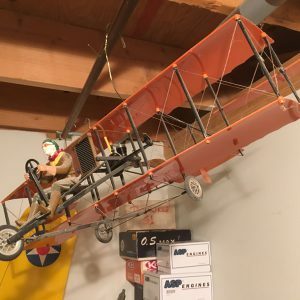 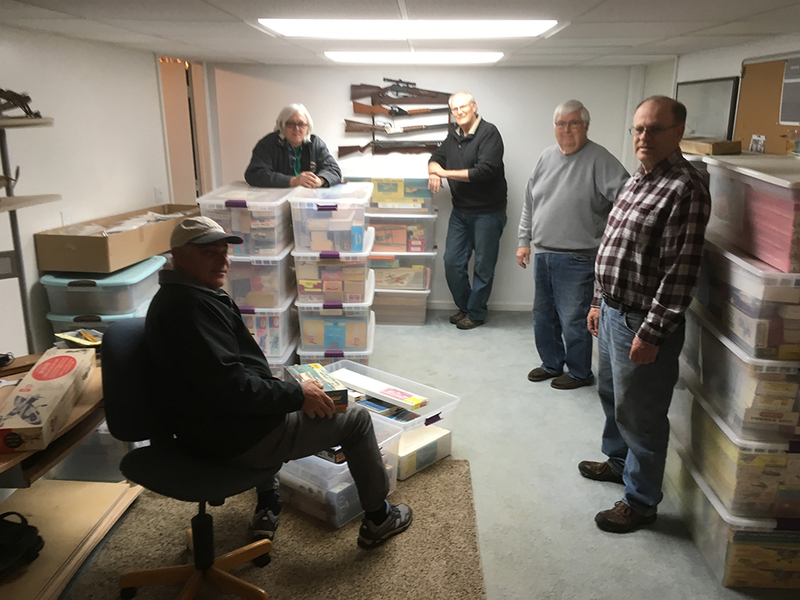 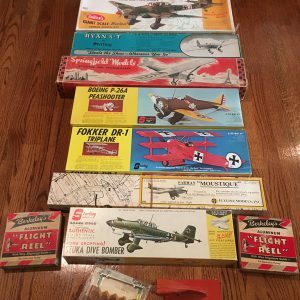 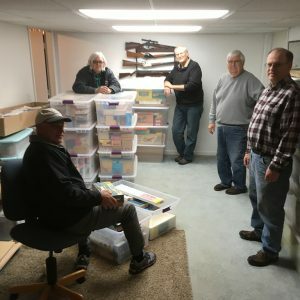 He is a collector and reseller who has built up a collection of primarily model airplane items from estate auctions, donations, personal contacts, and other means. 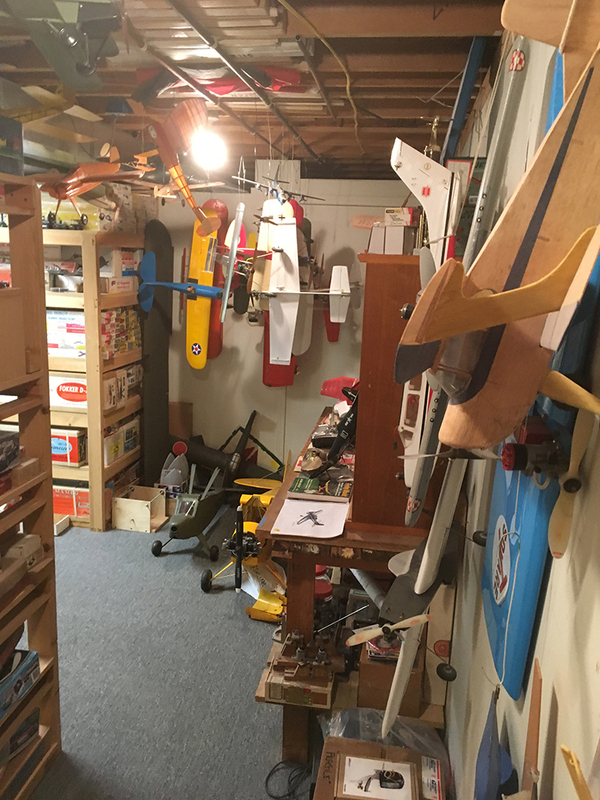 And, apparently, his basement is available, via appointment, for anyone who wants to peruse his collection and maybe purchase some items. 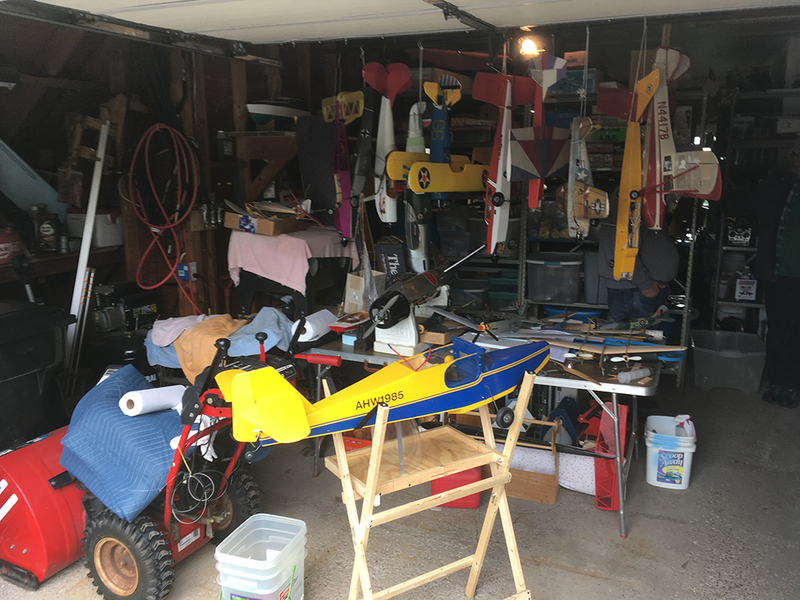 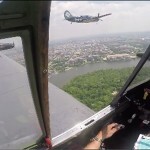 This past Saturday, my Control Line flying buddy, Steve Dwyer, and I made an ‘appointment’ and made the trek to Rochester where we met up with Jim McCarty at his house. 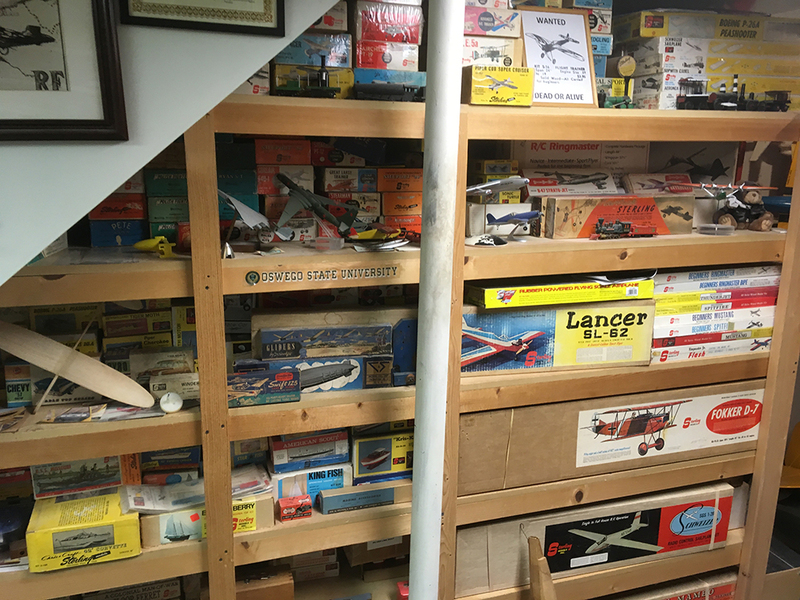 What we found there was a Candy Land of model airplane history: kits, engines, and almost anything else imaginable. 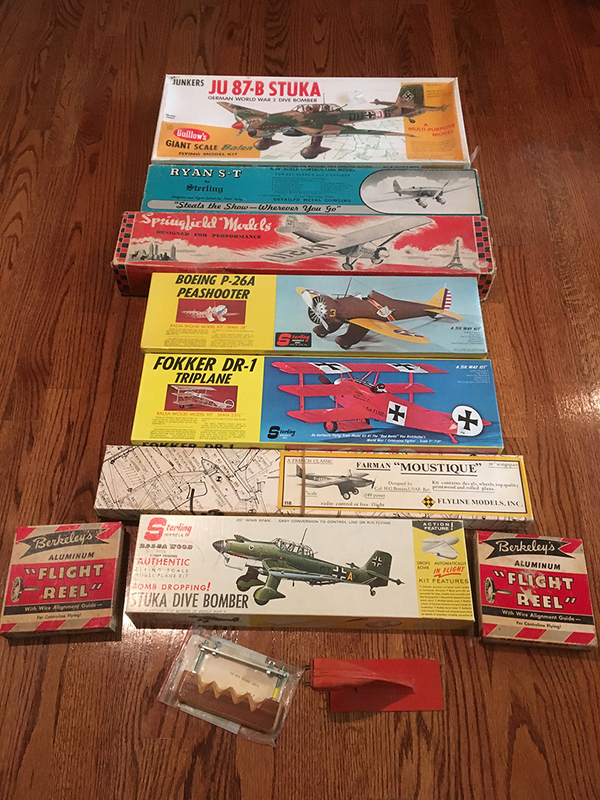 We had planned to spend a couple hours but ended up spending 3 ½ hours before I ran out of money for more purchases! 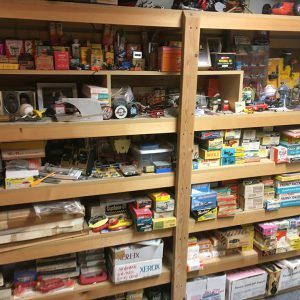 Even with another 3 ½ hours, we could not have seen all there was to see in Jim’s treasure-trove. 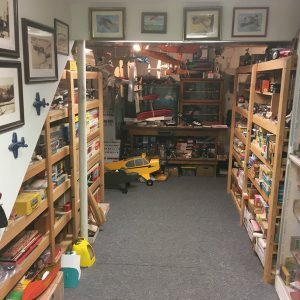 Besides the model airplane related items, Jim has several other categories of items which I had never personally seen before or was even totally unaware of. 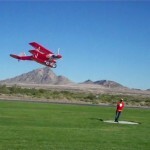 I’ve heard of and seen photos of Tether Cars but had never seen any in person. 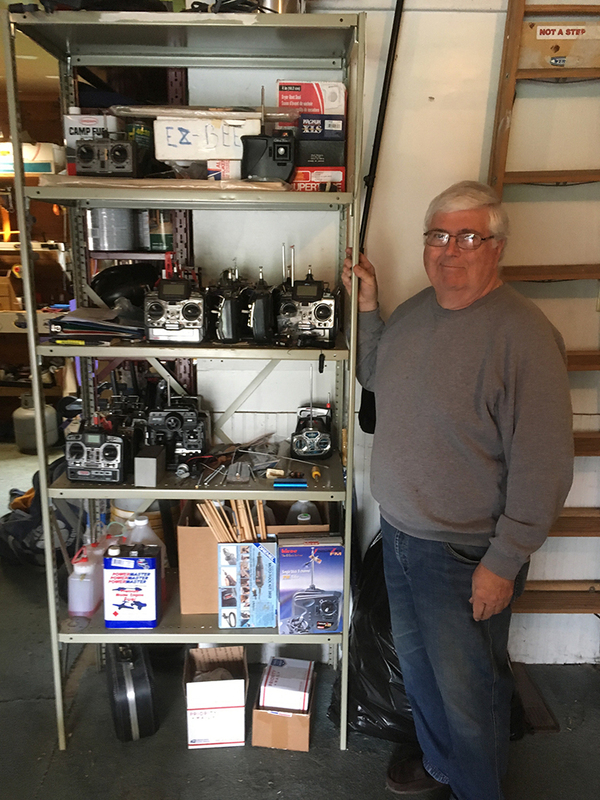 Jim has an extensive collection of tether cars that have engines ranging in size from .049 to .60. 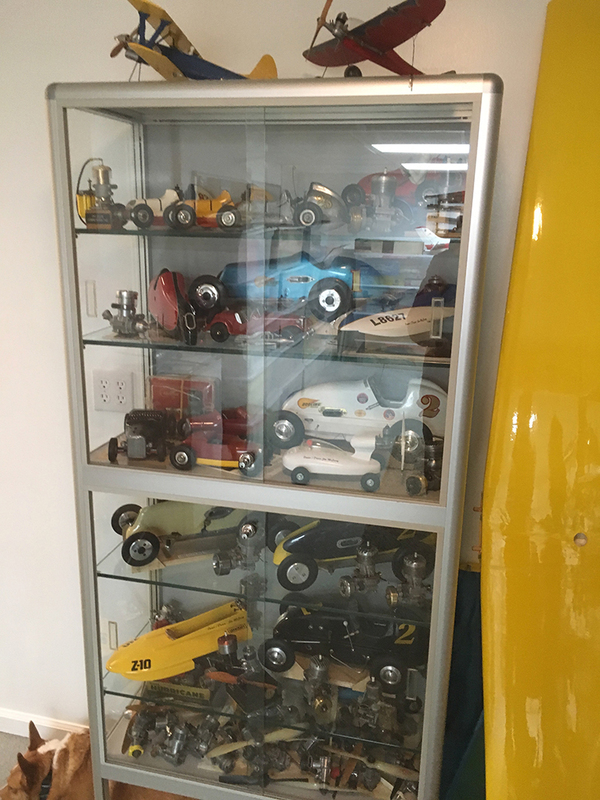 And these cars were show quality. 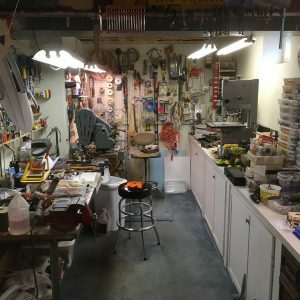 I was totally impressed! 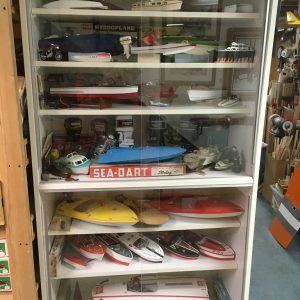 Another category of items I had not even heard of was glow powered outboard engines for use on model boats. 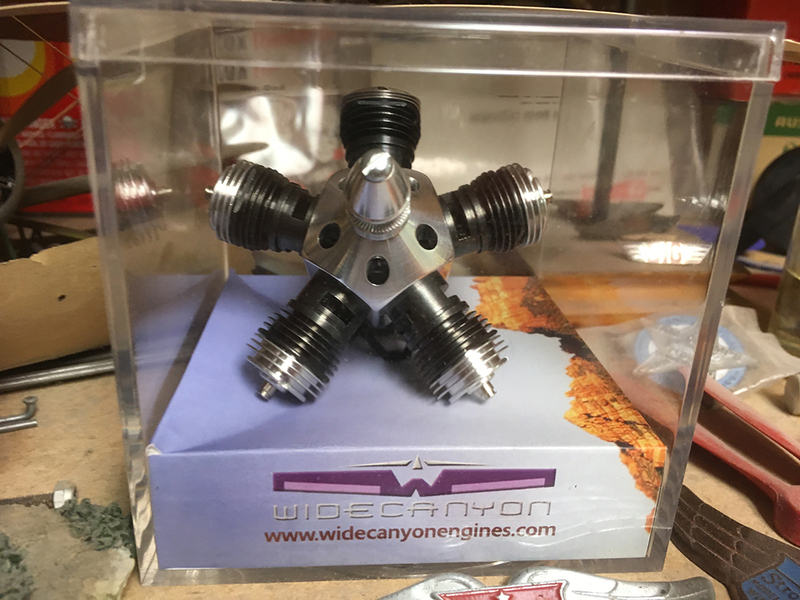 Jim has many examples of these engines on display and I was impressed by these little aquatic propulsion wonders. 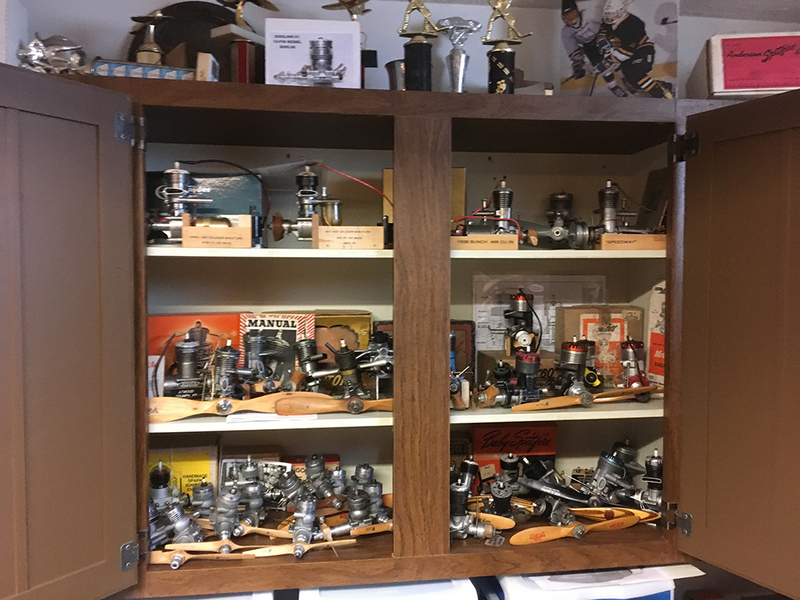 And speaking of engines, Jim specializes in collecting engines. 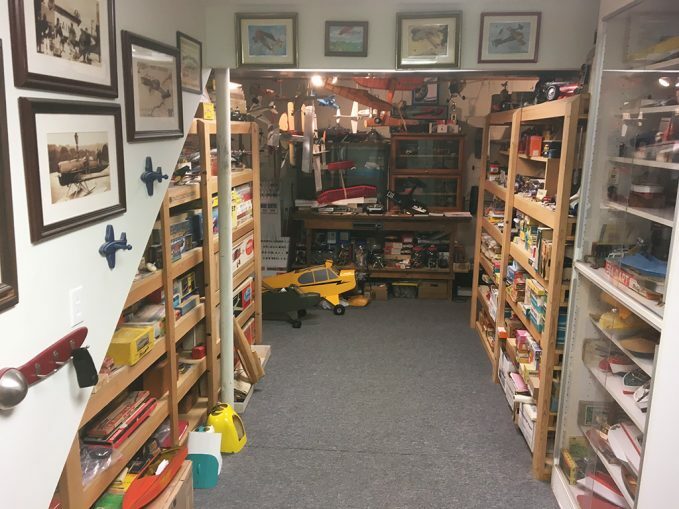 He has cabinets, drawers, storage bins, and shelves full of engines representing the entire history of model airplane engines. 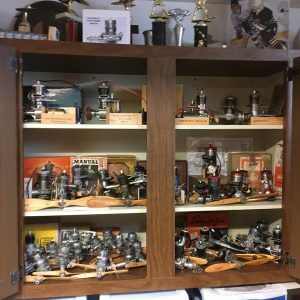 Virtually every type, size, and manufacturer of model engines are represented in his collection. 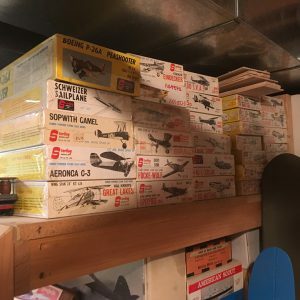 Are you interested in a model plane kit? 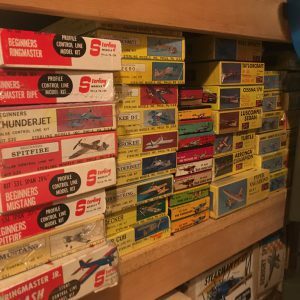 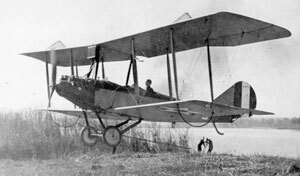 Jim has vintage, antique, and more current kits from kit manufacturers who haven’t been around since before I ever heard of model airplanes. 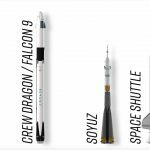 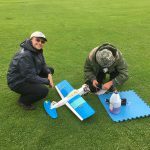 The kits include free flight, stick and tissue, control line, and radio control models. 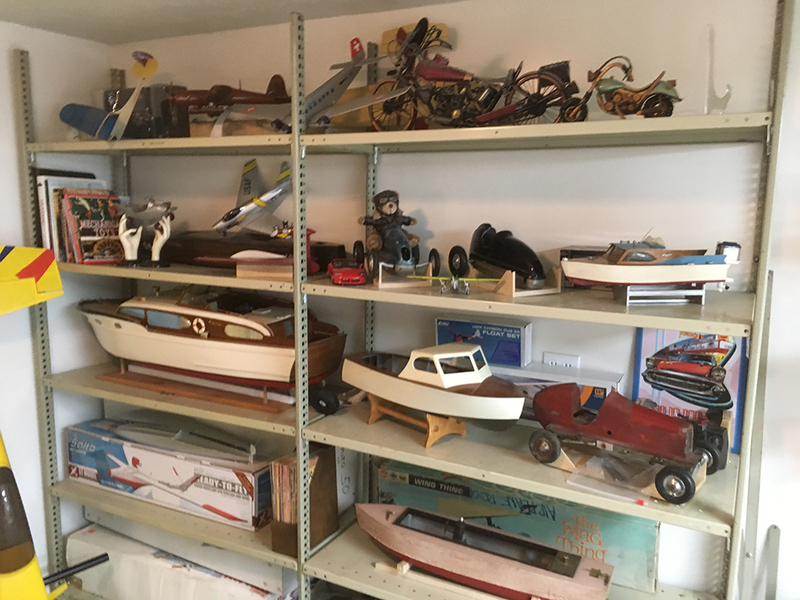 Jim seems to specialize in Sterling kits and has over 500 Sterling kits (including boat kits) in his extensive inventory. 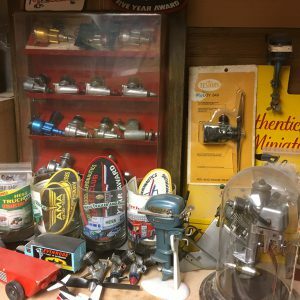 Like most collectors, everything in Jim’s collection has a story behind it so be prepared to spend some time learning about the history of any item you are interested in. 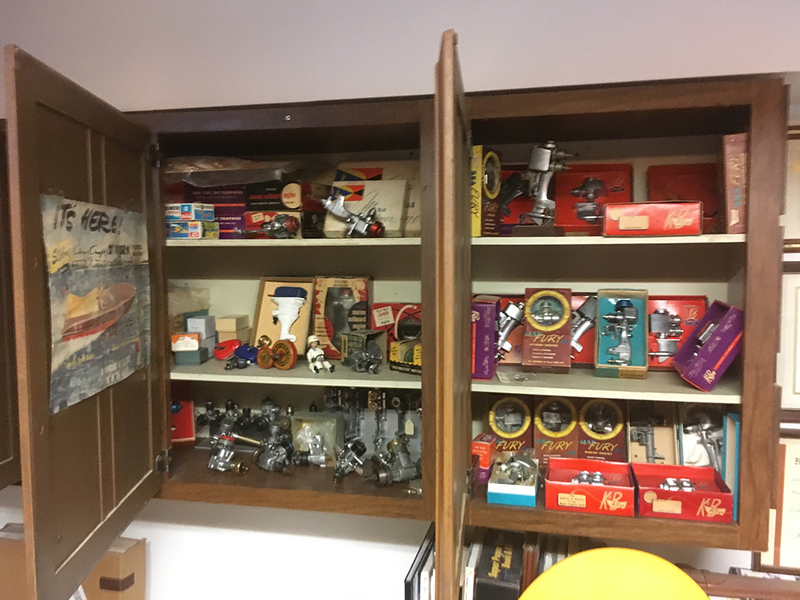 Besides the stories, Jim will also offer you a cup of fresh brewed coffee to drink while you peruse his collections, so he makes for a very generous host! 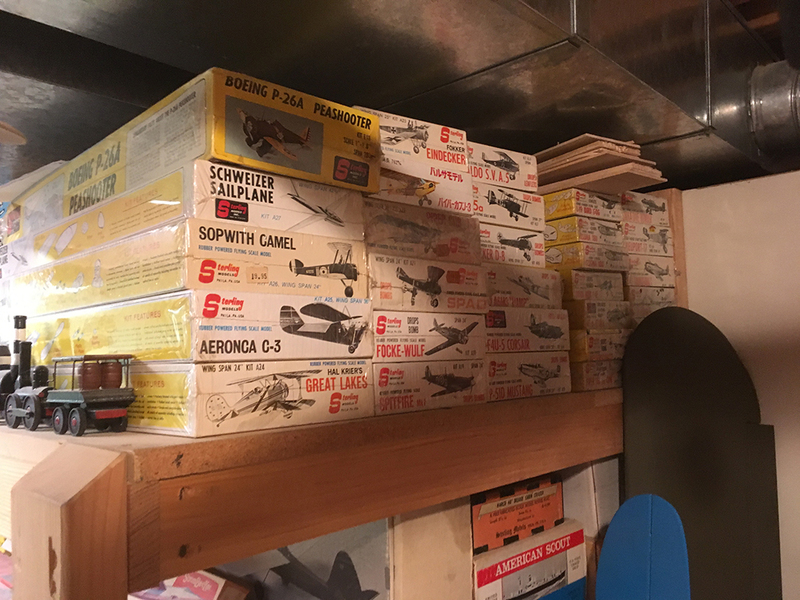 I expect that now that I know his location, I will be making more trips to Rochester in the future. 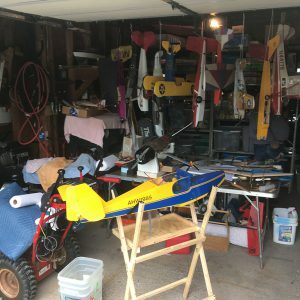 I just hope my wallet can survive the experience! 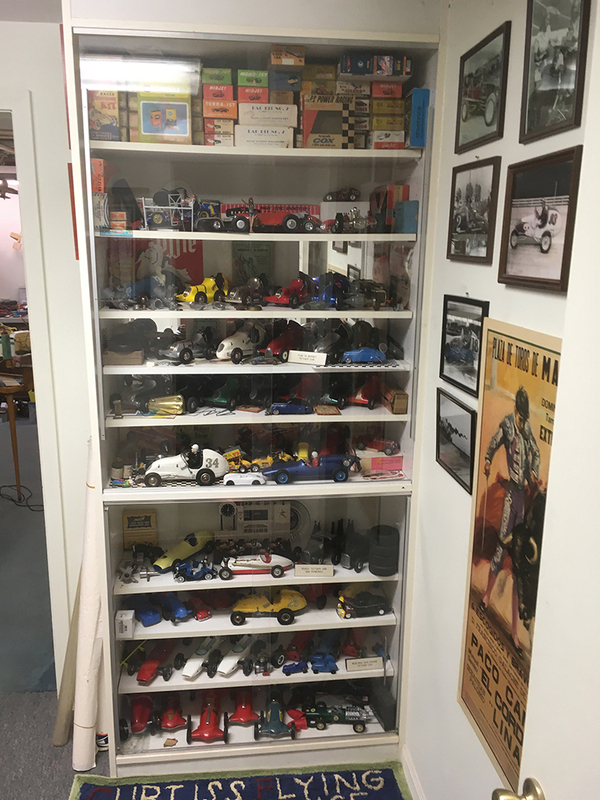 If anyone is interested in contacting Jim for your own personal tour, or would like to inquire about items in his collection that may be for sale, he can be contacted at the following email address: jmccarty@rochester.rr.com. 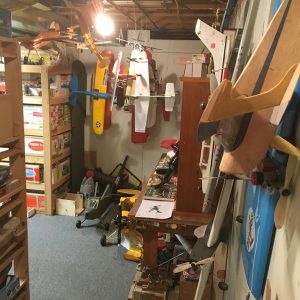 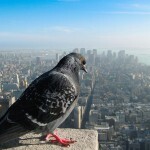 Be sure to tell him that you heard about him on FlyBoyz! 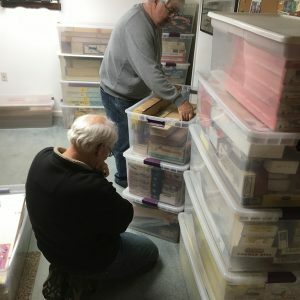 The following are a variety of photos that attempt to give some sense to what is contained in Jim’s Rochester Candy Land! 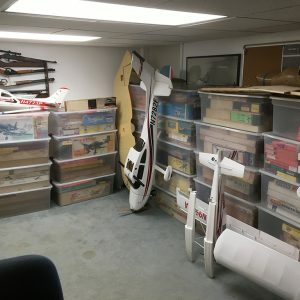 Go down the stairs to the basement, swing a 180 degree left turn and this is the view you’ll see! 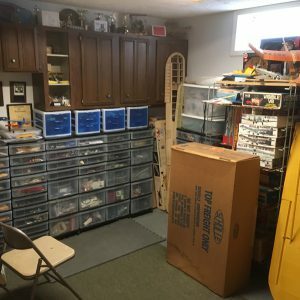 Kits, Kits, and more kits! 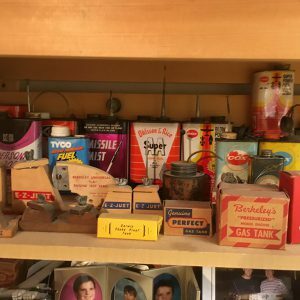 You want a Sterling kit? Not an inch of space (including the overhead) is wasted in this basement ‘hobby shop’. 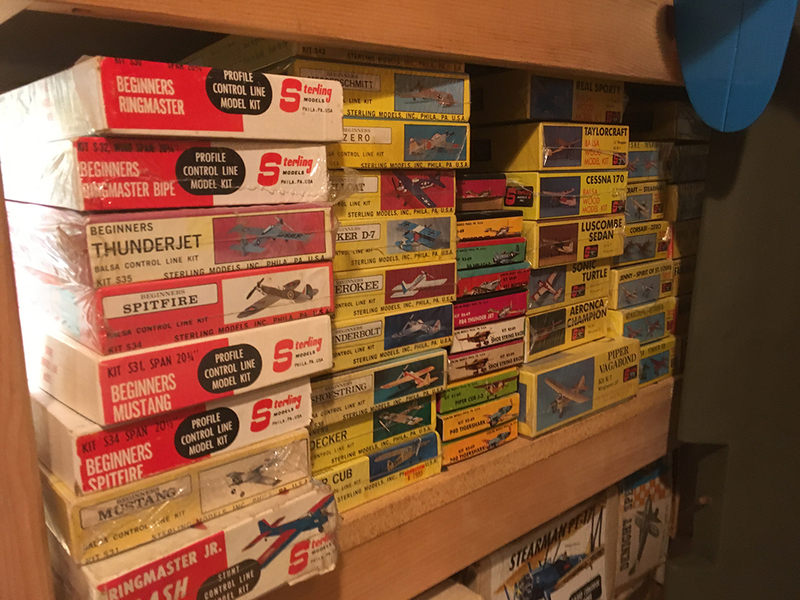 Vintage and unique models everywhere. 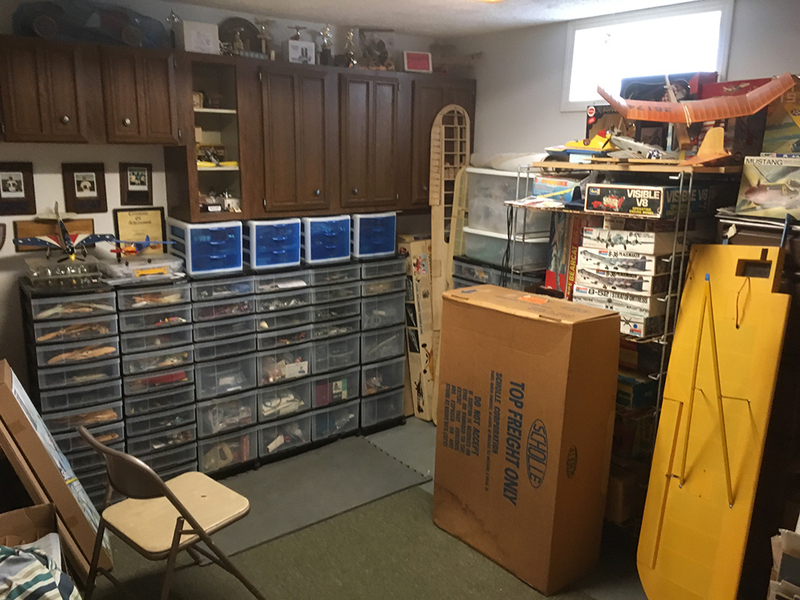 The back room filled with drawers and cabinets chock full of goodies! 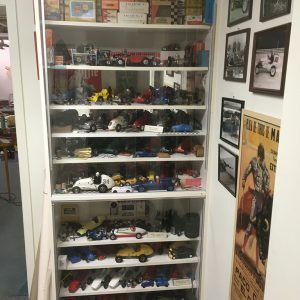 Cabinets filled with model engines. 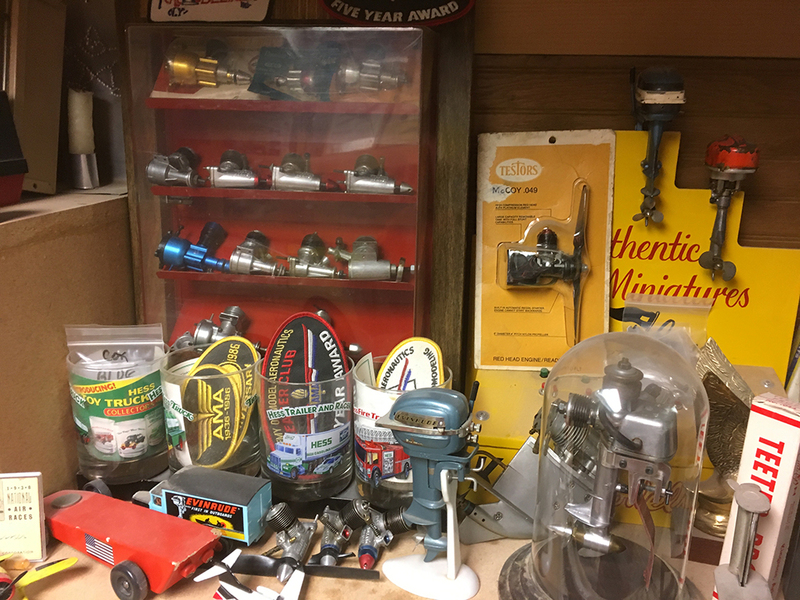 Open the cabinet doors and discover a treasure trove of model engines. 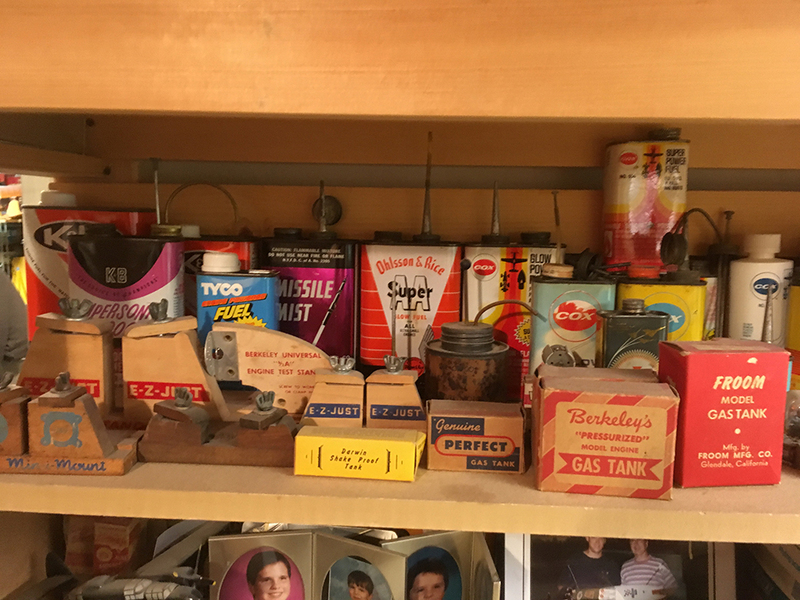 All sorts of items from days gone by. 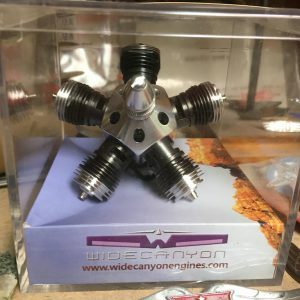 Amazing specialty engines were on display. 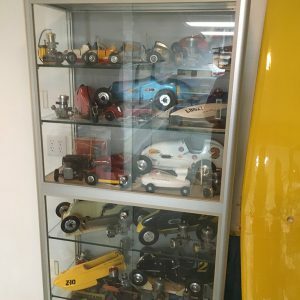 Beautiful Tether Cars on display. 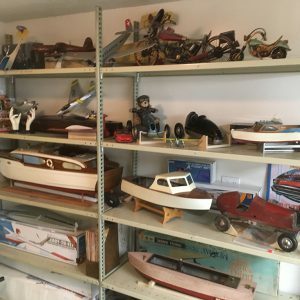 Classic boat models and other items on display. 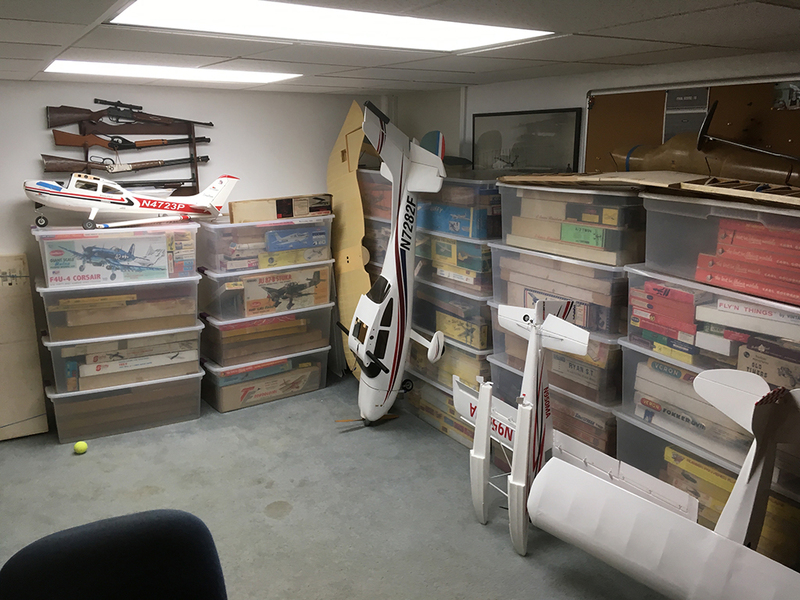 Plane kits neatly organized in individual totes. 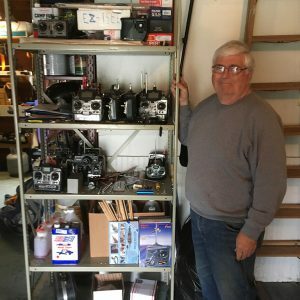 Jim (second from right) and some of his interested ‘customers’. 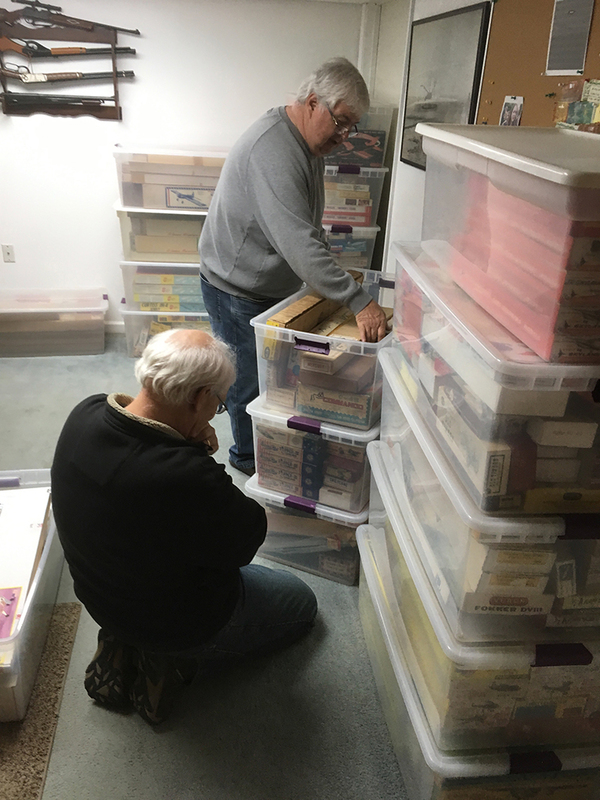 Steve Dwyer pondering his next purchase with Jim (standing) assisting in the decision process. 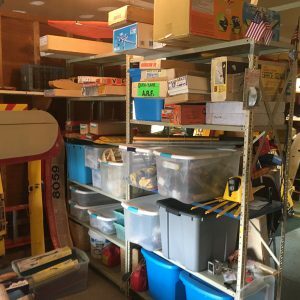 Covering materials, balsa, paints, and various shop supplies. 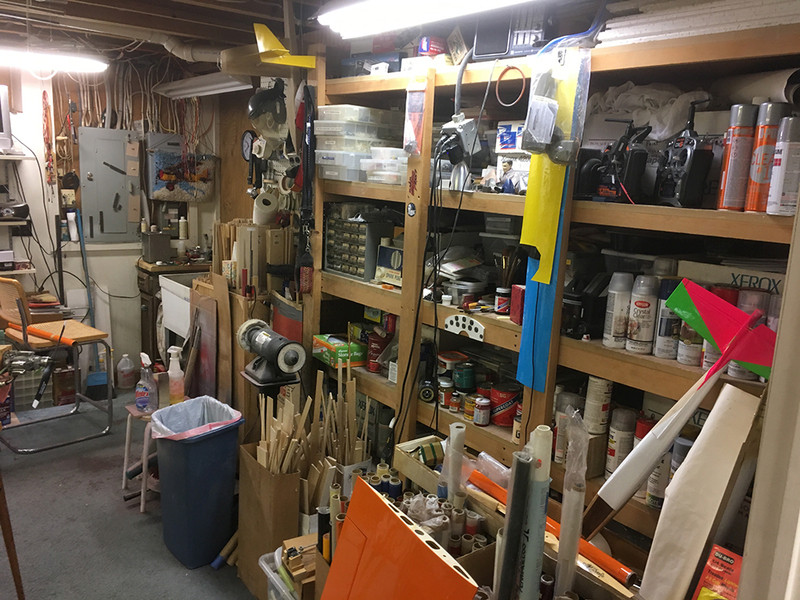 Jim’s workshop which includes a metal lathe (center back wall) for turning engine parts. 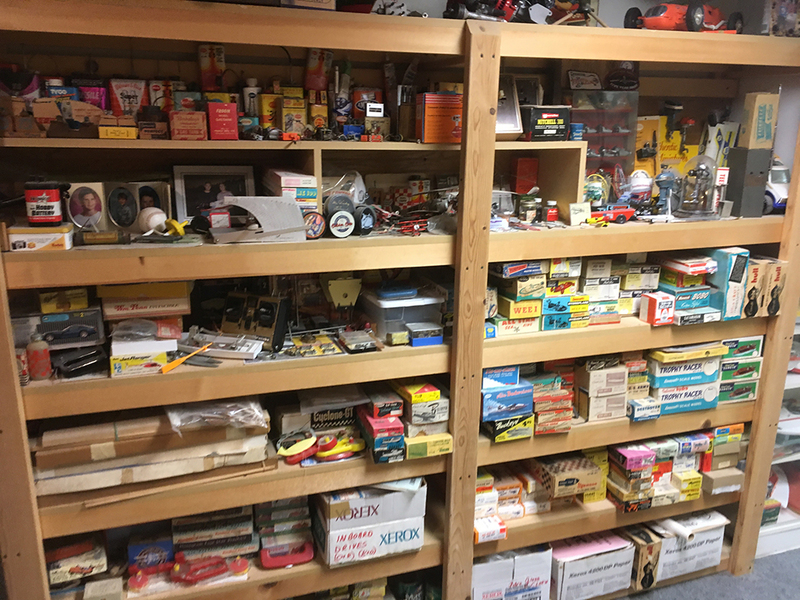 The garage serves as the ‘Shipping and Receiving’ department. 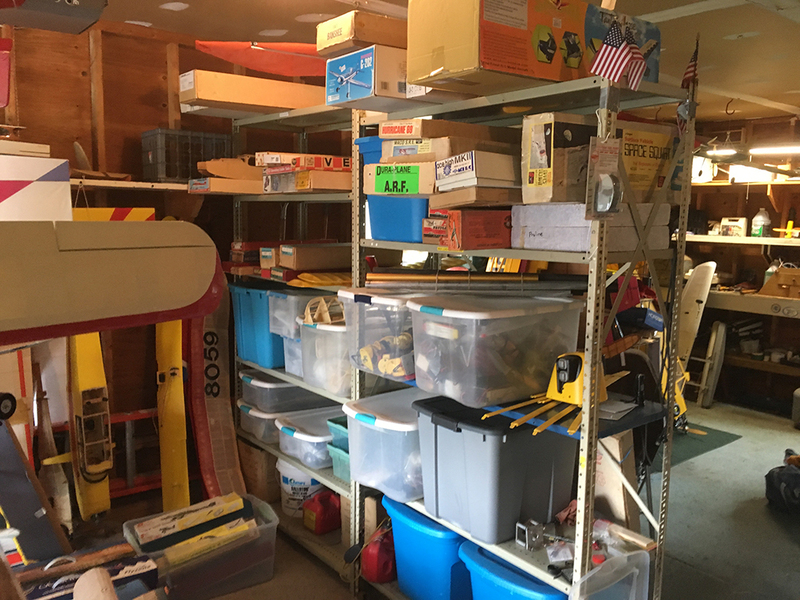 The garage ‘shipping and receiving’ staging area. 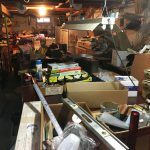 This is the hoard that I came away with from Candy Land. 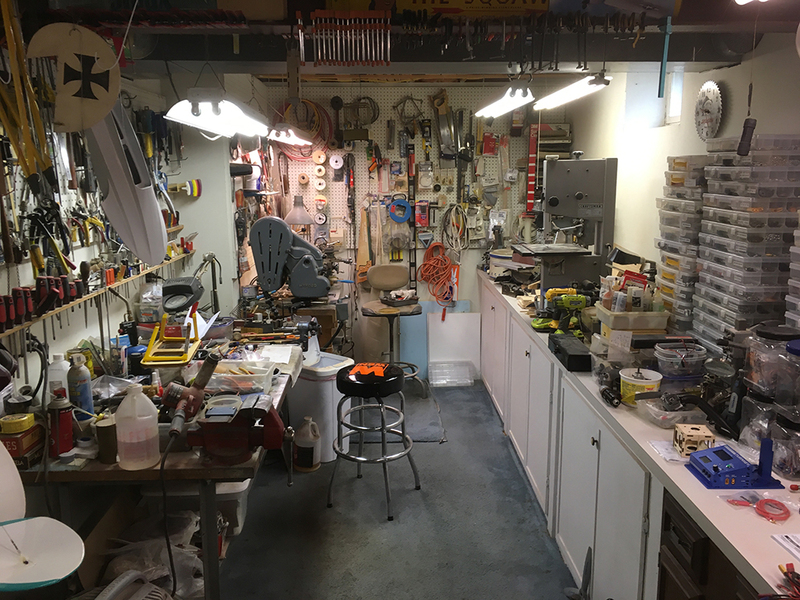 Thanks, Jim, for your hospitality!